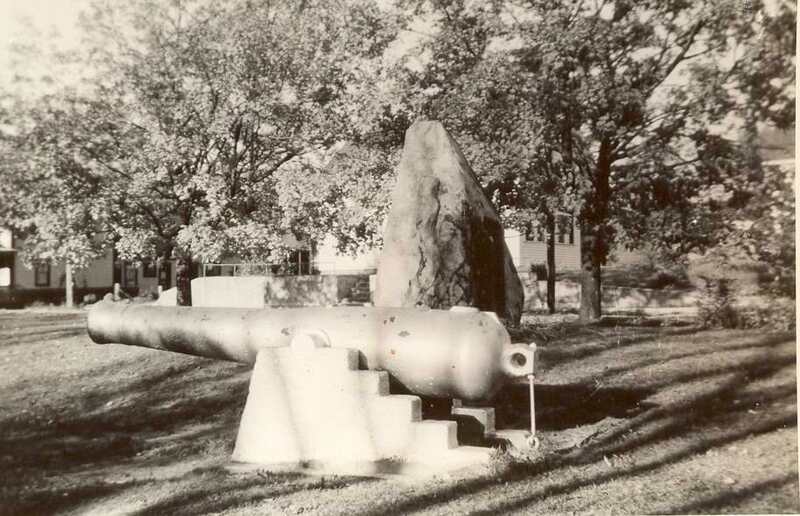 This US Navy Cannon at Library Park and an identical one at The Hudson Center Common, sat for years on their respective concrete moorings. Children would play on then, walk up the steps of the mooring and sit horse-back on the barrel of the cannon. Many family and group photos have been taken on or around them through the years. Occasionally on Halloween, teens would decorate the cannons by pouring random colors of paint over the barrel. The cannons were soon repainted in black by the wandering teens at the request of the Police Department or else by the Highway Department or some service organization. It is my understanding that these two 3-ton cannons were brought from the New Hampshire Armory on Canal Street in Nashua to Hudson in May 1929 through the efforts of Harry Emerson. One of them was placed on Library Park and the other at the Hudson Center Common. These cannons were cast in 1848 in a foundry near Boston and their serial numbers are within 2 digits of each other. The Library Park Cannon was fired but we are not sure if it was actually used in battle and if so, which battle. Harry Emerson was a long time resident of Central Street and at the time a custodian at the armory. He served the town of Hudson for over 50 years as a member of the Fire Department. Serving as Chief from 1946 to 1952. 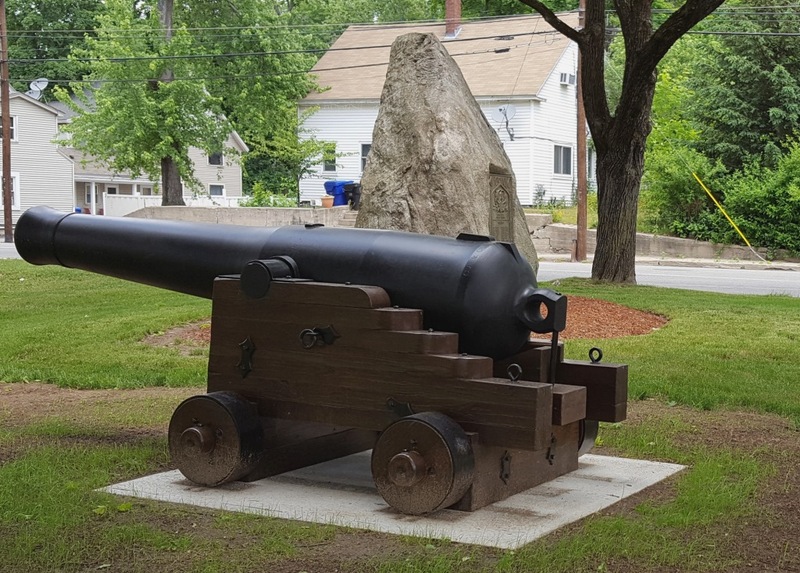 The Library Park cannon remained silently on the park until September 2, 2015 when it was involved in a collision with a school bus which was the victim of faulty brakes. Fortunately there were no students on the bus and the driver was not injured. Realizing the brakes were faulty the driver steered the bus onto the park, grazed a tree, hit the cannon and stopped! The cannon itself was not harmed but the concrete mooring was pulverized. The cannon and debris were removed by the Highway Department. For several months the cannon was at the town garage being sand blasted, restored, repainted, and a new mooring constructed. Earlier, in May of this year it was returned to Library Park; thanks to the efforts of our award winning Highway department; the recipient of the First Annual Community and Cultural Heritage Excellence Award sponsored by the Hudson Historical Society. Photos from the Society’s collection. By Ruth M Parker in Bridge Area, Historic Markers, Uncategorized on June 17, 2016 .